STEELE, Robert Hampton, a Representative from Connecticut; born in Hartford, Conn., November 3, 1938; attended the Wethersfield, Conn., public schools; B.A., Amherst College, Mass., 1960; M.A., Columbia University, N.Y., 1963; securities analyst, The Travelers Insurance Company, 1968-1970; elected simultaneously as a Republican to the Ninety-first and to the Ninety-second Congress by special election to fill the vacancy caused by the death of United States Representative William L. St. Onge, and reelected to the Ninety-third Congress (November 3, 1970-January 3, 1975); was not a candidate for reelection to the Ninety-fourth Congress in 1974; unsuccessful candidate for Governor of Connecticut in 1974; is a resident of Ledyard, Conn.
Ralph Nader Congress Project. 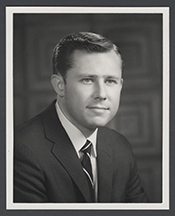 Citizens Look at Congress: Robert H. Steele, Republican Representative from Connecticut. Washington, D. C.: Grossman Publishers, 1972.